Julie Anna Gulenko is praised for her graceful soprano voice and sensitive musical interpretations. 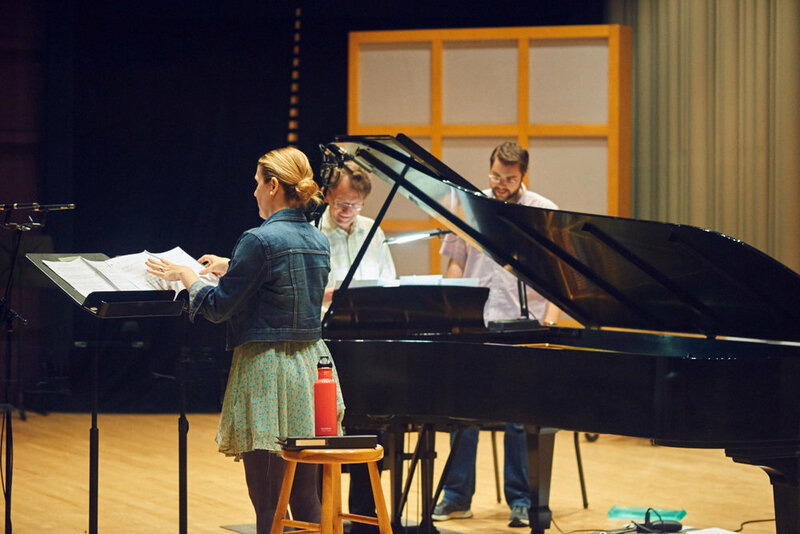 The northeast Ohio native is an alumna of Oberlin Conservatory of Music, where she studied with Marlene Rosen and performed in several Oberlin Opera Theater productions. ClevelandClassical.com noted the singer’s delightful approach to the role of Serpetta in Oberlin’s modern staging of La finta giardiniera by Mozart. Ms. Gulenko has made multiple appearances with both Canton Comic Opera and the Summit Choral Society, and has recently collaborated on performance projects with the Cleveland Ballet, the Western Reserve Historical Society, and the Tuesday Musical Association. The young artist has participated in master classes with Serbian mezzo-soprano Milena Kitic and Venezuelan soprano Inés Salazar. Allison Walmsley is a Toronto-based soprano acclaimed for her "extensive upper register and resonate bottom" and is known to be a "natural and alluring actress" -Ludwig van Toronto. Hailing from Saskatoon, SK, Allison is thrilled to be participating in the Ukrainian Art Song Summer Institute. She completed her Bachelor's degree in voice performance at the U of S with Dr. Garry Gable and Kathleen Lohrenz Gable. Allison received her Master's Degree in Voice Performance at Western University, under soprano Jackalyn Short, with whom she continues to study. Allison is a frequent participator in competitions and festivals including Gordon Wallis Opera competition (first place), the CFMTA Young Artist competition (First Place), Saskatoon Music Festival (Kinsmen award) and the Toronto Mozart Competition (finalist). Some operatic role highlights include Queen of the Night (The Magic Flute), Morgana in (Alcina), Nanetta (Falstaff), Cat in Saskatoon Opera's (The Bremen Town Musicians) and Emily in (Our Town). She most recently premiered two Canadian works in June with VCO: Kate in (The Covenant) and Luna in Padajuča Zvijezda. In July, she sang Adina in Elixir of Love with OBR. She looks forward to performing Handel's Messiah in December with the SSO. Hailing from Edmonton, Alberta, Douglas Graham is an emerging baritone, currently completing his Master's of Music Performance in voice at the University of Western Ontario, under the tutelage of Ted Baerg. Not coming from a Ukrainian background or heritage, Douglas was introduced first to Ukrainian choral music from choir director Dr. Melanie Turgeon during his undergrad at The King's University. A masterclass and concert from Pavlo Hunka further piqued his interest in Ukrainian art song and beyond. When he isn't performing on stage you can find him exploring the Canadian wilderness and capturing those moments on film. Kateryna (Katya) Khartova had moved to Canada from Ukraine in 2007 at the age of 18. During her first year in Saskatoon she started taking voice lessons and immediately fell in love with opera. In 2011 Katya was accepted into the Music Department at the University of Saskatchewan where she has been studying under the tutelage of Dr. Garry Gable and Kathleen Lohrenz Gable. In 2016 Khartova has graduated with a Music Bachelor Honours in Voice Performance. During her school years Katya has been a chorus member of the numerous opera productions with the Saskatoon Opera Association and was three times accepted to the Opera NUOVA 10 Day (2014, 2015) and the Six Weeks Intensive (2017) Summer Programs. She has won the Wallis Silver Memorial (2014) and Bronze Grand Awards (2015) at the Saskatchewan Music Festival. In March of 2017 year Kateryna Khartova had her orchestral debut with the Saskatoon Symphony Orchestra as a soprano soloist for the Ukrainian oratorio 'Golden Harvest' by Larysa Kuzmenko. She is now continuing her education at the Glenn Gould School of Music in Toronto in the class of Monica Whicher. OLEKSANDRA VERZOLE is an emerging soprano and recent graduate of the University of North Carolina Greensboro with a master’s degree in Voice Performance. She has performed in recent productions as Pamina The Magic Flute and Lucy The Telephone. She has participated in masterclasses with world renowned artists Shari Gruber and Sherrill Milnes. With Ukrainian as her background, Ukrainian choral and vocal music is dear to her heart. Oleksandra is very excited to be joining the Ukrainian Art Song Project for a second year. Olenka Slywynska has been praised with having “a lush, honey-coloured sound filling the hall, singing everyone else under the table” (Opera Canada). Ms. Slywynska performs in opera, oratorio and does recital work. She has enjoyed interesting recital opportunities at the Tanglewood Music Festival, Hamilton Philhamonic’s What’s Next festival, and ARC festivals. Olenka has performed oratorio with the Hamilton Philharmonic Symphony, Toronto Classical Singers, Vesnivka and many others. Ms. Slywynska has enjoyed singing in operas with the Highlands Opera Studio, Opera Chai and operas at the Glenn Gould School of Music. She has also sung in the Canadian Opera Company Chorus. Olenka has recently earned a Masters in Pedagogy from the University of Toronto and is presently teaching voice. Mezzo Soprano Ariane Meredith, Nova Scotia native, is a recent graduate from the Don Wright Faculty of Music at Western University. An ardent interpreter of song, she is excited to join the Ukrainian Art Song Summer Institute for a second season. While being a performer of opera and song, she is particularly passionate about sharing Eastern European repertoire. Highlights include a solo recital featuring Ukrainian and Russian song, the role of La Ciesca in Puccini’s Gianni Schicchi, and an appearance alongside Canadian tenor Benjamin Butterﬁeld and Hungarian-Canadian mezzo soprano Krisztina Szabó in Janáček’s The Diary of One Who Disappeared. Andrew Skitko earned his bachelor’s and master’s degrees at Westminster Choir College. Through Westminster, he performed with the world’s leading conductors and orchestras at venues such as Carnegie Hall and Lincoln Center. Skitko sings with the Opera Philadelphia Chorus, The Philadelphia Symphonic Choir, The Same Stream Choir, and participated in The Oxford University Choral Institute as a member of The Williamson Voices. He is a cantor for the Byzantine-Ruthenian Church, and also the artistic director of Theoria Chamber Choir, which performs Slavic choral repertoire.